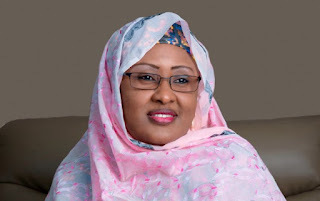 Wife of the President, Mrs. Aisha Buhari, has fulfilled her promise of donating proceeds from the public presentation of her book, “The Essentials of Beauty Therapy. A Complete Guide for Beauty Specialists,” to parents of the over 200 schoolgirls abducted from Chibok in April 2014 and the parents of the boys also abducted in Buni Yadi. According to a statement made available to journalists late on Tuesday by the Director of Media in her office, Zakari Yau Nadabo, a total of N55m was presented to the two categories of people at a brief ceremony inside the Presidential Villa, Abuja. 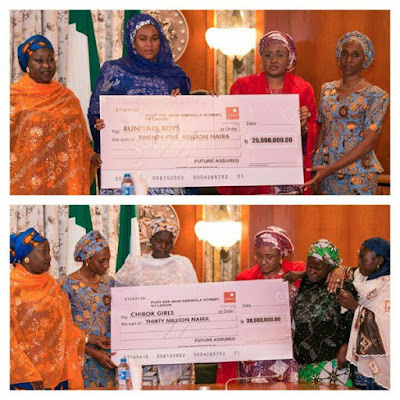 Although dignitaries who attended the public presentation on April 14 at the old Banquet Hall of the Presidential Villa had refused to disclose their donations, Mrs. Buhari had promised that the proceeds would go to the distraught parents. She also said the fund would be coordinated by wife of the Vice-President, Mrs. Dolapo Osinbajo. According to the statement, a cheque of N30m was presented to the representatives of the parents of the abducted Chibok girls while another cheque of N20m was presented to those from Buni Yadi. The statement also quoted Mrs. Buhari as urging the grieving parents to remain patient while government continues its effort to rescue the girls and reunite them with their families. She also expressed the hope that normal activities would be restored in all the areas affected by insurgency in due course. The Wife of the President was also said to have received a delegation of medical experts from abroad and their local partners on a crusade to stop tuberculosis. Mrs. Buhari promised to mobilise other major stakeholders for a nationwide campaign to stop tuberculosis and consistent advocacy through her Future Assured Initiative .